Today we are out here in the desert in Quartzsite Arizona and we’ve been having a pretty good time this week. It has been busy because we’ve been doing some socializing. 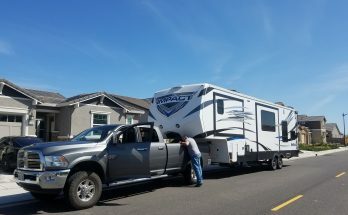 There’s so many full time RV’rs in the area and we’ve been meeting up with so many different people. We’ve been continuing our exploration of Quartzite; the RV count has kind of exploded this week. 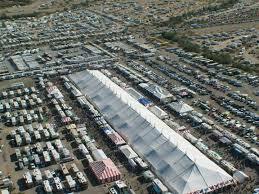 There is a RV show that’s going on, there’s a big tent area that has lots of vendors. This is kind of like a state fair there’s vendors everywhere and all kinds of things that you can buy. With all kinds of things you can do it’s kind of overwhelming. There are a lot of people pouring into the area to attend this event. We’ve just started hiking and exploring the desert and the surrounding area. Yesterday we took an adventure out to a place called the desert bar. Yeah it’s a bar that this guy built out in the middle absolutely nowhere. You need four-wheel drive so that you can get in but it’s not too difficult. It is completely desolate and it’s in the middle of nowhere in the desert. We want to talk a little bit about why people come to this remote area in the winter. 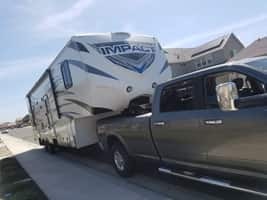 Besides the RV show a lot of it is because you can live extremely cheap in your Rv. It offers a really inexpensive winter getaway. Basically there are three different options you have for camping out here in quartzite. The first one is the one that we are using which are free BLM lands. You can stay up to 14 days on certain patches of BLM land. BLM is Bureau of Land Management and its public land and you just stay there for free. After those 14-days you have to move to another location a certain distance away. There are lots of those areas so you can basically hop around every two weeks all winter long. The other options for staying here are campgrounds there’s quite a few of them in the area. Some do offer water, electric and sewer hookups as well and you can get pretty good monthly rates. So people flock to those as well. Popular for people looking to stay here long term is the LTVA areas, or long-term vehicular areas. These areas are still part of the BLM land but they are designated for those long-term stays. The LDV areas do cost something it is forty dollars for two weeks so 20 bucks a week. You can buy a 180 dollar pass which is good for seven months. These areas offer water fill, sewer dump and trash collection at the entrance to each of the areas. They also have portable toilets in random areas across it so it makes it very easy to go camping in an RV out in the LTV areas. The area we are in we have to go into town to fill tanks, dump or get rid of garbage. So it makes it really easy to do LTVA areas for just that really nominal fee. You can stay here all winter long, well there is a 14-day limit on the LTVA areas as well. However you can move on to another area just like on the BLM land and stay there as well. Basically this is to make sure people don’t create little semi-permanent towns. This is public land and we all have access to it so you’re not allowed to live full time out here. This is very transient but you can really enjoy yourself and live pretty cost-effectively. So like I mentioned we had to take care of all our water and dumping needs by going into town. We have only spent about 25 the past 2 weeks this includes fuel for our generator. You don’t have electricity when you’re out on the LTV areas either you have a generator or share with a lot of people. 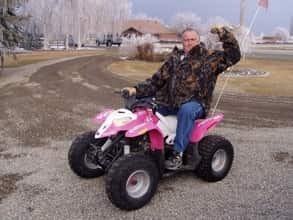 That 25 included fuel for the generator, propane, drinking water and that was it so that’s pretty inexpensive twenty five bucks a week to live out together. Quartzsite is basically a big valley and there are cell towers right in the middle of it. This area has pretty good cell coverage which is critical for being off grid as most of us are. We use it for phone and internet service. There are medical people that actually work full time out here. They can use this as a home base as like a winter getaway. They’ll come here and they stay in the LTVA areas and then they go off to do other things for like a week at a time. Then come back and continue to use it like they were all time. They can work right off the cell networks and that’s kind of cool. This place has been an awesome place for us to stay here in the winter. There’s so much socialization, you really get a sense of the RV community. 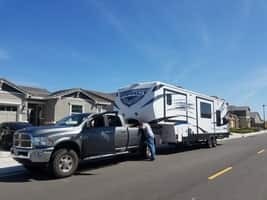 When we’re out traveling the rest of the year we don’t seem to get quite that much from the Rv community. This is really awesome it has sort of been fun to see the desert. You know kind of explore this way and that way away from everything else. If you do want solitude you can find it out here to. You can take your RV way into the BLM land. Occasionally you’ll see an RV way ahead of you and know and they’ve got it all themselves out there. So you can have a lot of socialization or you can come out here for some peace and quiet. Not to mention the weather here very infrequently freezes. We’re going through a little bit of a cold spell right now and it’s in like the upper fifties. The rest of the time we were here it was probably 70 degrees and sunny so it’s a very nice climate to be in. In the summertime you probably don’t want to be here it’s going to hang at a hundred plus degrees every single day. That’s when this town is only 3,000 people because it’s really hot.